A TRUST, Conservatorship OR PROBATE. What Is A Probate ? In general, Estate administration provides for the orderly distribution of real and personal property owned by a decedent. An administrator (administratrix) who is appointed by the court when there is no will, when the will does not name an executor or when the named executor is unable or unwilling to serve. The personal representative is charged with the fiduciary responsibility of gathering the assets and paying the debts of the decedent in such a way that the beneficiaries or heirs of the decedent receive the maximum inheritance. The personal representative usually will hire an estate attorney to handle the legal aspects of the probate. Most business dealings are through the estate attorney. 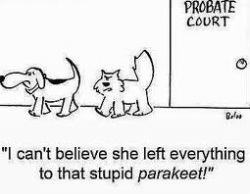 The Probate process can be complex. We encourage you to call or email us with your specific situation so we can assist you better or guide you in the right selling direction.